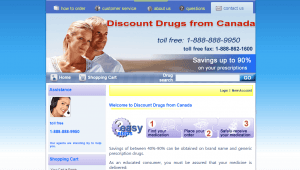 Discountdrugsfromcanada.com has been operational since 2001, providing affordable prescription and nonprescription medications to customers. Customers can receive up to 90% off prescriptions filled by the fully licensed pharmacy. With the care center operating out of New York, the qualified professionals review the prescription and send it to be dispatched from one of their licensed pharmacies. Payment methods accepted are Visa, MasterCard, bank drafts, and international money orders. If paying with a credit card, transaction fees may apply. The website itself is simple and easy to use, with all important information and instructions clearly ed. The customer service phone number is placed front and center, indicating that this company encourages the customers to communicate any questions or concerns. They provide an easily accessible list of the most popular medications on the left hand side of the main page. Discount Drugs from Canada has a standard $12 shipping fee, and take 8 to 12 days to ship after the initial 24-48 hours it may take to process the order and prescription. In order to track a shipment, a call to customer service is necessary, and all packages are insured fully for loss or damage during shipping. As per the standards of Ontario College of Pharmacists, the company cannot accept returns on any medications. There are no customer reviews or testimonials for Discountdrugsfromcanada.com. Interestingly enough, the site has a sticker claiming to be a verified member of Pharmacy Checker, but when clicked, it takes you to a site that says Discount Drugs from Canada is not a verified member. ScamAdviser ranks this site with a low trust rating. There are no coupons the website or on third-party sites, however customers can up to 90% off prescriptions filled by a fully licensed pharmacy. Discount Drugs from Canada is an extremely easy to use website with all of the important links at the top, such as frequent questions and contact information. This company may be legitimate, as it does require a valid prescription from a doctor and encourages customers to have their doctor call and speak with their customer care. The ScamAdviser rating is not arbitrary, and may have something to do with the status of Discount Drugs from Canada on the Pharmacy Checker website. It is a bit concerning that they have the Pharmacy Checker button on the site and they are not even a verified member currently. They might have been verified previously, there is just no way to tell now. If planning to purchase from Discount Drugs from Canada, it would be wise to take the advice of the site and have your physician call the company to verify that they carry the prescription you require. The lack of reviews and testimonials is a bit concerning, as companies usually like to prove their validity and excellent customer service through firsthand accounts. We would advise proceeding with caution when considering purchasing from this company, and checking other possible internet pharmacies that have a visible positive track record with their customers. This company receives 2 out of 5 stars.